While it seems like "United we stand, divided we fall" would be the war cry of a famous soldier, its actual first recorded use dates back to Aesop and his fables. This quote can be found as a direct statement in "The Four Oxen and the Lion." It can also be found indirectly in "The Bundle of Sticks." This quote can also be associated with a variety of public figures throughout history as well as writers and musicians who have used it to make an impact on their audience. The phrase "United we stand, divided we fall" has been traced back to the Greek story teller Aesop, who lived during the 6th Century B.C. Most people know him for the fables that have been handed down through time in his name, although as storytelling was an oral tradition, the true authorship of all these fables cannot be confirmed. Aesop may have penned some of the fables, but others have just been told in his name. 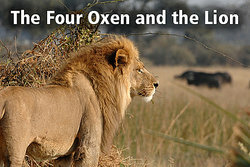 A lion used to prowl about a field in which four oxen used to dwell. Many a time he tried to attack them; but whenever he came near they turned their tails to warn another, so that whichever way he approached them he was met by the horns of one of them. At last, however, they fell a-quarrelling [sic] among themselves, and each went off to pasture alone in the separate corner of the field. Then the Lion attacked them one by one and soon made an end of all four. The phrase, "United we stand, divided we fall," is not used directly in this fable. However, the moral of the story is the same. "My sons, if you are of one mind, and unite to assist each other, you will be as this bundle, uninjured by all the attempts of your enemies; but if you are divided among yourselves, you will be broken as easily as these sticks." Although his sentiment can be found in two of his fables, Aesop was certainly not the last one to use this quote. It has endured for thousands of years and remains an important life lesson to learn. You can find more quotes form Aesop's fables here. "The Liberty Song" by John Dickinson, written in 1768. One line in the song is: "Then join hand in hand, brave Americans all! By uniting we stand, by dividing we fall." "The Flag of Our Union" written by poet and journalist George Pope Morris in 1853. It uses the phrase in this verse: "A song for our banner! The watchword recall which gave the Republic her station: 'United we stand, divided we fall!' It made and preserves us a nation!" Patrick Henry used the phrase in his last public speech, given in March 1799, where he said, "Let us trust God, and our better judgment to set us right hereafter. United we stand, divided we fall. Let us not split into factions which must destroy that union upon which our existence hangs." This phrase is Kentucky's state motto and can also be found on the Missouri state flag. The flag displays two grizzly bears around a shield which has "United We Stand, Divided We Fall" written around it. J.K. Rowling uses a variation of the phrase in Harry Potter and the Goblet of Fire, when Albus Dumbledore says, "We are only as strong as we are united, as weak as we are divided." Pink Floyd's song "Hey You" contains the following lyric: "Hey you, don't tell me there's no hope at all, Together we stand, divided we fall." Def Leppard's song "When Love & Hate Collide" switches up the phrase in the following lyric: "I got your number on my wall, but I ain't gonna make that call, When divided we stand baby, united we fall." Brotherhood of Man uses the phrase in their song "United We Stand" as seen in these lyrics: "For united we stand, divided we fall, And if our backs should ever be against the wall, We'll be together, together, you and I." During Super Bowl 50, the phrase was used as part of Marvel Studio's ad campaign for Captain America: Civil War. This phrase was a theme in the movie as well. The popular motto "united we stand, divided we fall," often shortened to "united we stand," is commonly used to express unity and collaboration. The phrase is used to encourage and inspire, and sends the message that working together is easier, as there is strength in numbers, whereas doing things alone is harder and invites failure. This phrase has been used time and again throughout history to rally groups together and you will still hear it used today where the message remains the same. "Who Said \"United We Stand Divided We Fall\"?." YourDictionary, n.d. Web. 21 April 2019. <https://quotes.yourdictionary.com/articles/who-said-united-we-stand-divided-we-fall.html>. While it seems like “United we stand, divided we fall” would be the war cry of a famous soldier, its actual first recorded use dates back to Aesop and his fables. This quote can be found as a direct statement in “The Four Oxen and the Lion.” It can also be found indirectly in “The Bundle of Sticks.” This quote can also be associated with a variety of public figures throughout history as well as writers and musicians who have used it to make an impact on their audience.